Head coach Daryl Powell was pleased with the way his side found a way to win and handled having to make several reshuffles in the Wakefield game. Absences before the game and injuries to Luke Gale and Jake Webster during it meant that the Tigers had Michael Shenton playing on the wing, back rowers in the centres and Paul McShane at half-back in the second half yet they still kept their opponents scoreless in the second 40 minutes and controlled the game for large periods. “It was an awkward game for us,” said Cas boss Powell. “We had to shuffle the team around consistently. That made it difficult, but I thought in the second half once we got a grip of the game we were pretty good. “The first half was just stop-start and the game just never got a flow about it. There were a lot of stoppages. “Conditions were difficult and it was pretty heavy out there, but we keep winning. “We’re not at our best, but we are getting two points and that’s the main thing. “Luke Gale is all right, but there’s a bit of soreness in his knee and then he got a knock in the first tackle of the game. “That obviously forced a reshuffle and we’d already lost Ben Roberts before the game so it wasn’t ideal. But I thought we handled it well. Powell praised a number of his players. He added: “Paul McShane did a great job for us at half-back. His little legs cannot go any faster than on that try can they? “His kicking game was great. He’s a clever player and to be able to play in different positions is really good for us. “I could put Adam Milner into nine and he’ll be sore in his hips – he’s not used to getting down at dummy-half as he used to do. To get a try from dummy-half is a rare commodity for Adz so he’ll be pleased with that. “Jesse (Sene-Lefao) was really good. His energy is great anyway. He started the game for us and he’s come off the bench a lot. You never see anyone cheering a dropped ball by the opposition like he does! “Gadwin Springer created some tempo for us. We were struggling a little bit to get the speed of the game going and he did pretty well with that. 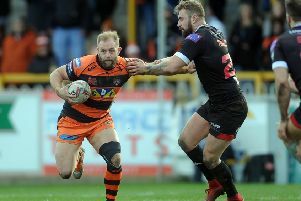 “I thought Liam Watts’ second stint was outstanding and it was good to have Junior Moors back out there as well – we’ve got some real competition for places in the front row. It’s a really competitive position for us.